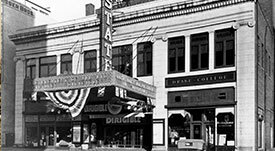 The historic State Theatre, a magnificently renovated 1921 vaudeville/silent-film house, was built as a grand movie palace in the heyday of silent film and vaudeville. So declared theater manager Walter Reade in a quarter-page announcement in the Daily Home News of December 20, 1921, as he prepared to open the doors of the State Theatre to the citizens of central New Jersey. Reade’s State Theatre was designed by one of the most accomplished theater architects of the day, Thomas W. Lamb, and was one of the biggest, most lavish, and modern theaters in the region. The December 26, 1921 opening matinee audience—including the first ticket buyer, nine-year old Victor Levin of Paterson Street, New Brunswick—willingly paid the twenty-, thirty-, or fifty-cents admission. They were treated to a live orchestra concert and a tenor rendition of “The Star Spangled Banner.” The first feature presentation was the silent film, White Oak, a western melodrama starring cowboy hero William S. Hart. 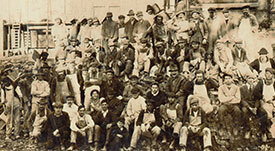 There were also five vaudeville acts, a newsreel, and a nature film. A few years after the opening, the theater’s management was transferred to the B.F. Keith theater chain. Benjamin Franklin Keith and his partner, Edward Franklin Albee, operated the largest string of vaudeville theaters and the largest booking agency for vaudeville acts in the east. Eventually vaudeville and silent movies were superseded by films with sound (“talkies”), at which point Radio-Keith Orpheum (RKO) began operating the facility. The RKO logo can still be seen above the brass window boxes at the theater’s entrance. Eventually, the business merged with the largest western booking agency, Orpheum, to form Keith-Albee-Orpheum (KAO). The Radio Corporation of America (RCA), which entered the motion picture business after the advent of sound, acquired KAO in 1928. RCA renamed its new subsidiary Radio-Keith-Orpheum, or RKO. As the “RKO State Theatre,” it entered upon its most successful period; during the dazzling years of the Golden Age of Hollywood, the State offered the biggest stars and pictures, the best-dressed and most attentive ushers, and over two thousand plush velvet seats. Among the hundreds of first-run hits shown here were Ivanhoe, starring Elizabeth Taylor; Old Maid, with Bette Davis; and Giant, starring Rock Hudson, Elizabeth Taylor, and James Dean. The glamour in those days was not confined to celluloid; celebrities frequently made live guest appearances to promote their films or to help a worthy cause. In the forties, Hedy Lamarr pitched war bonds at the State Theatre, while an obscure announcer named Walter Cronkite came here to announce the U.S. Infantry Band. 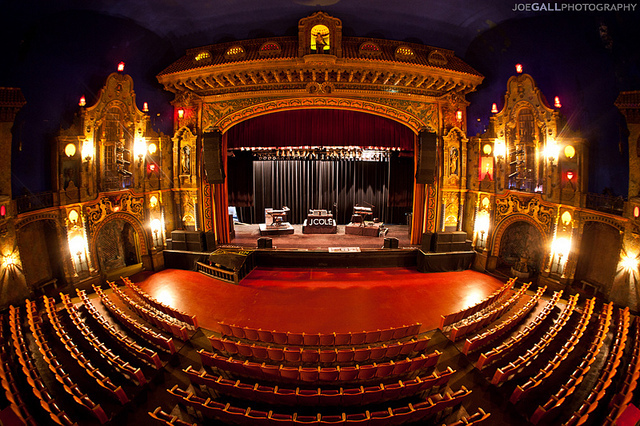 The State Theatre rapidly established a reputation as the “class act” in town, known for its opulent décor, superb acoustics, and array of cinematic and live attractions. 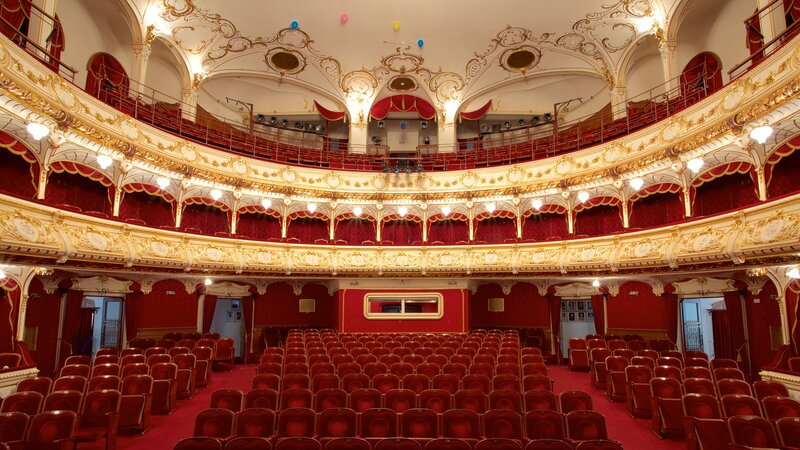 Stars appearing in person at the theater in its early days included Bob Hope, Barbara Stanwyck, Minnie Pearl, Gary Cooper, Bela Lugosi, Houdini, Helen Traubel, Blackstone the Magician, Colonel de Basil’s Ballet Russe de Monte Carlo, and more. The State Theatre continued to thrive well into the sixties; until eventually audiences began flocking to new suburban multiplex cinemas. In the face of this decline, RKO sold the building to a concern that converted the once-proud State Theatre into a rental facility that occasionally showed adult films. Years of neglect left it out of proper working order, and a leaky roof caused a great deal of water damage. By the 1970s, it was in ruins. It persisted in this condition until 1979, when it was purchased by the New Brunswick Development Corporation (DevCo) as part of New Brunswick’s revitalization project. Critics began to wonder if the State Theatre could be saved. 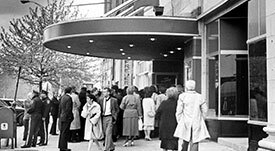 In 1986, the New Brunswick Cultural Center acquired the State Theatre from New Brunswick Development Corporation and, by the fall of 1987, work was underway to reclaim the building from the ravages of time. 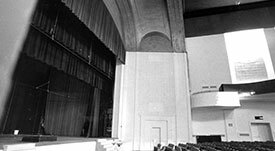 Transformed back into a handsome, well-equipped facility for live performances, the State Theatre reopened April 24, 1988 with a performance by the Jerusalem Symphony Orchestra. The reopening set the press and public raving about the hall’s visual and acoustical splendors. Since 1988, more than 5 million people have attended performances and events. ACOUSTICS 10, SEATS 10, AMBIANCE 10! …THE ART DECO LOOK OF THE THEATER IS BEAUTIFUL AS WELL. THE STATE THEATRE IS NEW JERSEY’S CARNEGIE HALL.